Kuanoni Kaniaupio Crozier won first place in the Celebration of Hula O Na Keiki competition last week. Tiana Manuel, 11, and Kuanoni Kaniaupio Crozier, 13, won the top awards at last weekend's Celebration of Hula O Na Keiki (Dance of the Children) at the Kaanapali Beach Hotel on Maui. Both children dance for Halau Kekuaokala'au'ala'iliahi, directed by kumu hula Iliahi and Haunani Joy Paredes. 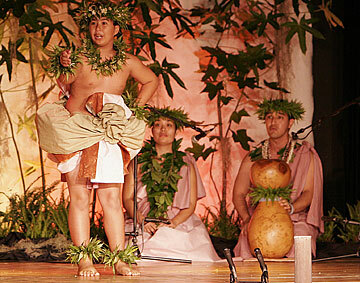 Children ages 9 to 17 competed over two days, representing eight halau. Tiana won the Overall Wahine Division title, and Kuanoni won the Overall Kane Division. Each received a $250 cash award in memory of Dr. George Kanahele, the perpetual Pahu Drum and other prizes. Nearly 40 prizes and cash awards totaling $10,000 were presented overall. This was the first competition for their halau. A Hula O Na Keiki winner herself, Haunani Joy Paredes is the first to go from competing to returning with her own halau. 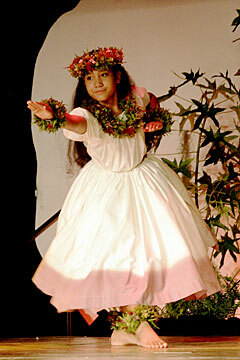 Tiana Manuel also won first place in the Celebration of Hula O Na Keiki competition last week.